Lawler starts with the “discovery” of the bird by the ancient Egyptians and carries us back through the Indus Civilization, (now Pakistan and northwestern India) and then forward through to the far east and eventually, the Western world. 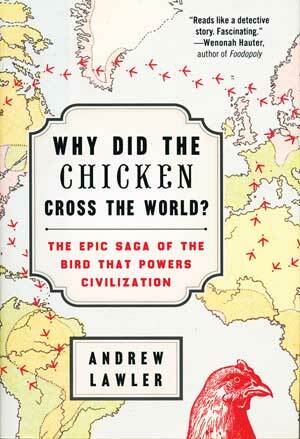 The book reads like a detective story with Lawler visiting different historians and archeologists along the way, piecing together chapters in the intertwined existence of humans and chickens. Did you know that Mexicans are the number one egg consumers (400 eggs a year per capita)? Or that China’s consumption of chicken meat is the most massive – 22 pounds per year for each of the over 1.4 billion people in that country. Or that the the United States leads the world in chicken consumption per person – and by a long shot no less? With facts and figures like tha, this book is both gripping and enlightening. Hard cover, 265 pages plus notes and index. Originally $26, now as a remainder book from the N-News, only $11.95 plus s&h.